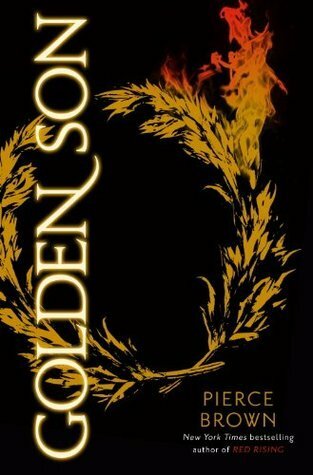 Golden Son, by Pierce Brown is the second book in the Red Rising Trilogy. I reviewed the first book, Red Rising, in February 2014. Read the review here. I gushed over Red Rising…it was a stupendous book, and since that title was a debut novel, it was an even more tremendous achievement. In Red Rising, we met Darrow, nicknamed Reaper, a cast limited red worker who, after a genetic transformation into a ruling class gold, finds a way to make a prominent place for himself in their priveleged ranks. He strives to make the ruling class pay for the death of his wife, Eo, and honor her quest to change society for the better. However, as he works and lives and loves among the golds, he finds that his initial quest may be a naive one. He cares for the golds as well as the reds, and often questions who he is that Eo believed he could make a difference. In Golden Son, Darrow’s journey continues, picking up immediately after the events in the first book. Darrow has made progress in his goal, one to gain a place of prominence and influence among the golds. Others conspire against him, for they want prominence just as much as Darrow does. Darrow soon finds his battle is a much bigger affair than he realized, and he and his alleys face some truly daunting obsticles. Tensions increase, battles rage, and strageties and alligences shift and realign. Darrow, being Darrow, rises to the occasion, and you can sense that other forces, other tides in society, may be rising too. I won’t spoil anything here. This is an even more awesome book than Red Rising, and that is saying something. All I can say is read it, and read it now. If you can put either of these two books down once you start, then perhaps you need to have your glasses checked or your head examined. And to Mr. Pierce Brown? My gosh, but you really must write faster. How in the world can I wait to see how this all ends? Note: Red Rising was on sale in the Kindle store for $1.99 on 1/7/2015. So if you need to purchase it, the time is now! Go for it!